Targeted treatments have revolutionized care for lung cancer patients whose tumors harbor ALK or ROS1 alterations. Basically, cancers may use these genetic changes to drive their growth, but also become dependent on the action of these altered genes for their survival. Targeted treatments like crizotinib block the actions of ALK and ROS1, thus killing cancers that depend on them. However, when doctors target ALK or ROS1, cancers often evolve new ways to survive. After a period of success, targeted treatments against ALK+ and ROS1+ lung cancers often fail. A University of Colorado Cancer Center study published today in the journal Clinical Cancer Research provides an in-depth look at how these ALK+ and ROS1+ cancers evolve to resist treatment. A second study demonstrates the ability to identify these changes in patient blood samples, perhaps easing the ability to monitor patients for these changes that provide early evidence that treatment is failing. Unfortunately, the first study shows there is no single or even a dominant way that ALK+ and ROS1+ lung cancers change in response to targeted treatments. 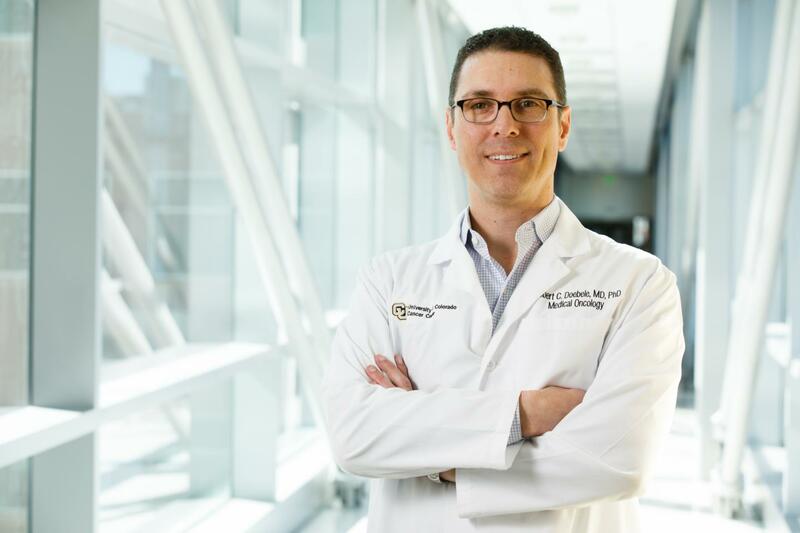 "If there were only one change that follows these treatments, we would know that when treatment fails, we should switch to another, defined treatment," says Robert C. Doebele, MD, PhD, director of the CU Cancer Center Thoracic Oncology Research Initiative. "However, rather than providing a path of action, this study throws down a challenge: There's a lot of stuff we're not looking for or don't even know how to look for, but might be treatable if we knew how to look for it." Doebele worked with CU postdoctoral fellow Caroline McCoach, MD (now an assistant professor of medical oncology at University of California at San Francisco), to examine tumor samples of 12 ROS1+ patients and 43 ALK+ patients that had evolved to resist targeted treatment. As expected, a percentage of these samples showed genetic changes somewhat similar to the original causes – ALK and ROS1 are both "kinases" that can control the expression of other genes. In one of the 12 ROS1+ samples and 15 of the 43 ALK+ samples, new kinases had been altered to allow treatment resistance. In the researchers' opinion, these are encouraging cases because, "these kinase mutations are the easiest to detect and, conceptually, the easiest to treat," Doebele says. This ease of detection and possibility to treat kinase mutations with drugs similar to those that already treat ALK+ and ROS1+ lung cancers have led researchers to focus on these changes. "But we found a lot of stuff besides kinase mutations," he says. "What we're trying to say is that resistance happens in a lot of different ways and we need to be thinking about all the genetic and non-genetic changes that can occur." For example, one ROS1+ cell line had no identifiable genetic changes. Genetically, the cancer should have remained sensitive to treatments targeting ROS1. But functional analysis showed that the known breast cancer driver, HER2, was creating drug resistance in this cell line. "On one hand, the panoply of resistance mechanisms that can occur is incredibly frustrating. You're taking a small population of patients and further subdividing them into many other resistance mechanisms. How do we attack that, respond to that resistance when every patient is a little different?" Doebele says. "But on the other hand, though we are learning that resistance is really complex, the more we look and the better our tests are at capturing different types of alterations, the more we are able to target these resistance mechanisms. That's incredibly exciting." A second paper, published as a companion to the first, shows that once resistance mechanisms are defined, doctors may be able to test lung cancer patients for these changes by sifting blood samples for DNA signatures released by cancers. "Basically, we show that circulating tumor DNA or ctDNA can show us what's driving the cancer at any given point," Doebele says. "In theory, this strategy gives us an alternate method to spot these changes without having to do a biopsy." In addition to being less invasive, the use of ctDNA to monitor a cancer's genetics saves time. "Due to the time it takes to schedule a biopsy and then the two weeks it takes to run a tumor test, using ctDNA instead can save patients a week or more." Knowing when a mechanism of drug resistance has evolved can ensure that patients have the opportunity to explore new treatment options as soon as possible. Testing ctDNA in blood also allows researchers to take an overall sample of cancer genetics, rather than being limited to a snapshot of genetics from a single site of biopsy, "possibly giving us a broader picture of what's going on," Doebele says. However, this and other studies show that ctDNA has somewhat reduced sensitivity compared with biopsy and, "we may miss things," Doebele says, implying that analysis of ctDNA may be an appropriate strategy to monitor tumor evolution in addition to but not instead of biopsy. The current paper used the ctDNA test Guardant360 to explore blood samples of 88 ALK+ lung cancer patients, showing the partner genes that "fused" with ALK to cause cancer (including EML4, STRN and others). Thirty-one of these patients were tested again at the time their cancer progressed after ALK-targeted treatment. In 16 of these blood samples, researchers found that the ctDNA test was able to identify ALK resistance mechanisms. "There's been a huge focus on kinase mutations," Doebele says. "But not everything is driven by a simple mutation. A focus on broader testing and on new methods of broad testing will help us widen our net to catch these other changes that are driving resistance to ALK and ROS1 targeted treatments."